Making a two-putt from any significant distance requires two things: A good read of the green, so you can anticipate the break, and good distance control in your putt. Both aspects were covered in detail in Comprehensive Keys to the Green. But even then, every once in a while when making a long putt I’d scuff the club on the ground. As a result, I’d wind up leaving the ball woefully short. That’s where most of my three-putts came from — because after the “scuff”, the ball was nowhere near close enough to hole out on the next putt. The fix is to add the “hover” to the putting sequence. 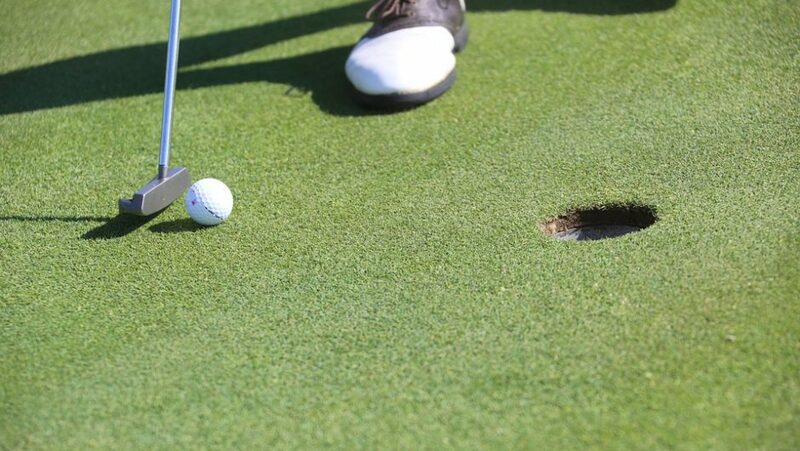 With your normal grip, place the putter on the ground behind the ball, as though you were about to putt. Relax your hands, bend forward a tiny amount, and let your hands drop slightly lower on the club. Now firm up your grip and return to your normal stance. The club is now hovering a fraction of an inch behind the ball, eliminating any tendency to scuff the ground. Folks of the Jack Nicklaus persuasion will want to do their hovering before they address the ball — because, until recently, once you set the club on the ground you were deemed to have addressed the ball, and if it moved for any reason after that, it cost you a stroke. However, that rule is currently being changed, so that anytime the ball is unintentionally moved it can be put back in place with no penalty.